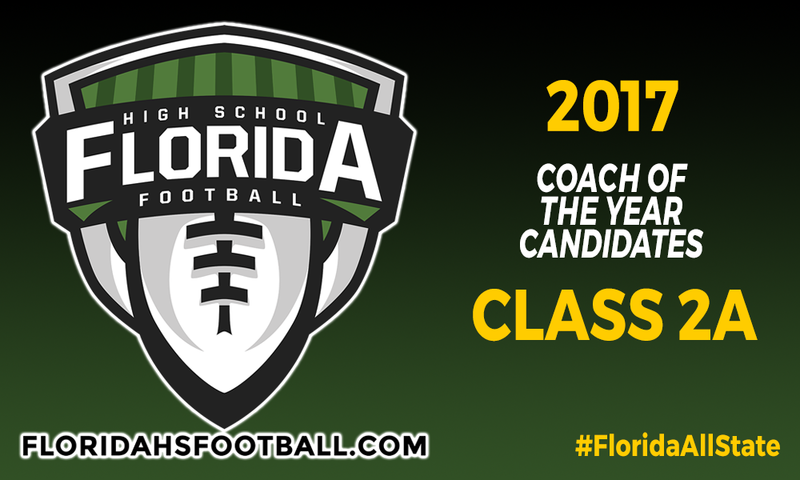 GAINESVILLE, Fla. — With the final step to fully closing the 2017 season is almost here, we are proud to reveal our candidates for our Class 2A Coach of the Year candidates. For Coach of the Year, five coaches are selected as candidates based upon the resume they had for the season. For Player of the Year, three players are selected on offense and three on defense as candidates for Offensive Player of the Year and Defensive Player of the Year. One player from each classification of the six candidates total will be selected as the Overall Player of the Year for their respective classification. • Dennis Marroquin, Hialeah Champagnat Catholic (9-2) – Took the Lions to their second straight state championship game and their first Class 2A title since 2013. • Bob Dare, Tampa Cambridge Christian (9-3) – Took Cambridge Christian to its second state semifinal appearance in three years. • Rayburn Greene, Lecanto Seven Rivers Christian (9-3) – Led Seven Rivers Christian to their first playoff berth in school history as well as first playoff win, reaching the Class 2A regional finals. • Max Manin, Moore Haven (10-1) – Took over as head coach prior to fall practices starting, leading the Terriers to an unbeaten regular season and appearance in the regional finals. • Damon Jones, Naples St. John Neumann (9-1) – Has revived the football program at St. John Neuman going 14-6 since taking over after a 0-9 season in 2015, leading the Celtics to a perfect record during the regular season and first playoff appearance since 2011.